One of the town’s larger one bedroom cottages, Green Gables offers privacy, comfort and charm to its guests. Ideally located, its back screened-in porch allows convenient access to the Seaside Swim and Tennis Club. The first floor includes a comfortable queen bed and bath (shower only). A delightful spiral staircase leads upstairs to the second floor where you will find a cozy living room, dining area, and a small kitchenette (no dishwasher), as well as a lovely Juliette balcony to enjoy the view and Seaside air. Please no children under the age of 12 please. This cottage is booking up fast for July and August! Green Gables is a participant in our Spotlight Savings Special, click here for more details. Click here for pictures of Green Gables. 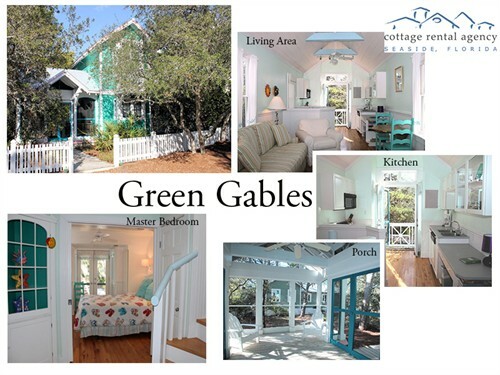 Click here for the virtual tour of Green Gables. The Cottage Rental Agency’s “Spotlight Savings Special” offer is available for stays July1- 31, 2013 for participating cottages; limited availability and not applicable to existing reservations or groups; bike rentals are provided by the CRA Bike Shop; golf voucher provided by Sandestin Golf has additional restrictions and tee times must be made 72 hours in advance; beach toys are limited supply and based on availability; additional restrictions may apply. Special offers and packages are not bookable online, as all rates reflected online represents the full rate. For availability and reservations, please call toll- free at 1-855-811-8113 .